In part one I wrote about how the idea for Keith's Cavers was born and how it was key to get the opening credits sequence perfect, but at that stage I didn't have an idea for the video. It was just like being a kid at school who has spent weeks creating the best title page ever for his project but hadn't actually done anything towards the project itself. So with the opening sequence almost complete it was now time to decide on how to fill the remaining 6 minutes or so. 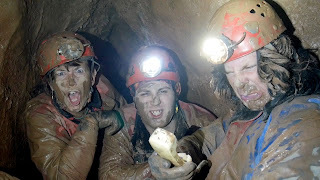 As it was the conference opening video my first idea was to make a video (humorous of course) showing how members of Dudley Caving Club set about preparing for participating in the various Hidden Earth competitions. This was discussed with team members and received universal approval. I'll leave it to your imagination to think of the range of possibilities that were discussed for filming things like sack stuffing, ladder coiling, knot tying and photography. Although it had merit and would have been an excellent theme for the opening video I felt it was too safe an option. It would require very little filming underground and I do think that the majority of a HE opening video should feature subterranean footage. 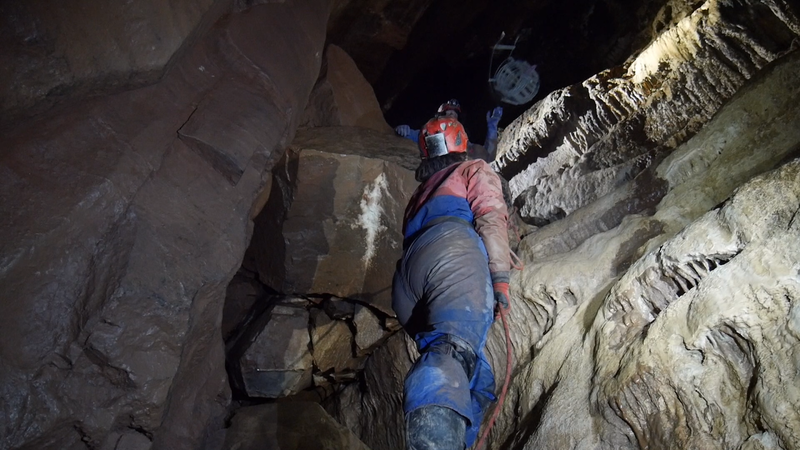 My second idea was to base it on a caving trip we undertook in 2013 which didn't go quite according to plan. I had always thought that it would make a great video as it involved several incidents and a race against the clock which incidentally later featured as a lyric in The World of Caving. "Will we ever make our callout time?" We had gone to make an attempt on the Prokofiev Series in Ogof Ffynnon Ddu and chickened out at the 'horrible exposed' climb. That left us with time on our hands so we attempted to exit via Swamp Creek where the various incidents occurred. All the way through we were saying to each other how we were pleased that it was a one-way trip as none of us fancied reversing the route we had just come though. Eventually with time running out and not knowing really where we were in the cave, and with the way on looking like an almost impossible traverse across very narrow ledges with a very deep vadose trench below, we decided the only thing to do was to turn back. 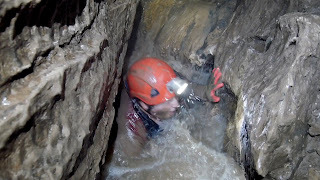 This led to the race against time and the ladder incident which occurred almost exactly as portrayed in Keith's Cavers. Fans of my videos may remember my five part mini-series, The Dudley, Caving and Cakes where we managed to lose Brendan. I thought we could use the search for Brendan as the basis for the Angel's mission. It was decided to film this second option, review the footage and then decide if it was going to work or whether it would be better to revert to the first idea. So we set off to South Wales for a day's filming. Definitely the best shot of the day was Kay falling into the 'little puddle'. I'd done this twice before and knew that it was very difficult when coming through the slot head first to stay out of the water which isn't just a little puddle by the way. So I went through feet first with my camera box to get ready for the shot. Kay had watched what I did and started to follow my lead. "No, no, no," I shouted. "You must come through head first!" Obviously there was no guarantee that she would fall into the water quite so spectacularly but sometimes luck is just on yer side, and a moment of pure comedy gold was created. This also got the biggest laugh when the video was premiered at Hidden Earth 2018. I made an edit of the footage we had taken and sent it off for comment. The overwhelming reaction was that it was okay but nowhere near good enough. Jess made a number of suggestions - cutting bits out that didn't work and re-sequencing the rest. 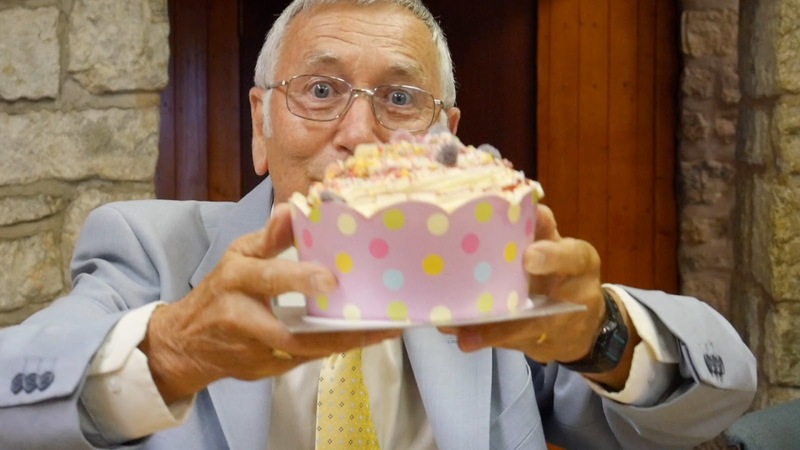 The resulting edit was much better but left us with continuity gaps which would require another visit to South Wales. We had also got to film the Angels being briefed. This was done one Thursday evening in the windmill. In Charlie's Angels, Bosley hands the Angels a box of chocolates with a large bow on top. I decided that as the video starred Mark this would have to be a cake - a large pink cake. Ian turned up for his role as Boseley, Margo donned on the wig, we set up the room with all of the props (desk, speaker, projector, screen) but when I was ready to begin filming Ian had disappeared. "Where is Ian," I asked. "He's gone to the toilet," came the reply. "Don't know. The usual I expect, but he's taking his time." Then Ian emerged wearing his best suit and tie. Not only did this make the scene, it also shows just how much support I can count on from my caving colleagues. I had only got one problem left to solve and that was how to end the video. We discussed this many times at Club meetings and various suggestions were made, some of which would have made much better endings, but would have led to another issue - the video would have been too long. Eventually we decided to use the telephone ending as it was quite short and if the Angel's could pull the right facial expressions then it would make an excellent freeze frame for the closing credits. With the opening titles and briefing sequences complete we set off for South Wales again to film the ending and the other scenes that were necessary for continuity. However try as I might there is still one continuity error in the final video. Has anyone spotted it? I have to thank Mark for scripting and acting the final scene and all three Angels for wallowing in mud. It was exactly what was needed for the scene to work. In the concluding part of this post I will write about the technical and other aspects of making the video.